When we drew up a wish list for the creation of a modern, USA Made, steel Gran Criterium, we fully understood the size and magnitude of the task. The challenge of producing a performance driven package - a package that would excite riders of all ages and abilities - led us to the belief that this frame should point forwards, and become a statement of our intent. Utilizing custom drawn, Italian made Columbus Life tubing and paired with ENVE's Road 2.0, tapered, composite fork, this package is light, rigid and responsive, regardless of conditions or fare. The Gran Criterium is a thoroughbred steel racer, born from the spirit, vision and reputation of our founder; Faliero Masi. Made from Columbus Life custom drawn tube sets, manufactured and sourced directly from Columbus, Milan. 44 mm head tube to accommodate the tapered fork crown and oversize bearing. Each frame has its serial number incorporated within the seat mast decal. A Color matched Silca Impero pump can be purchased as an upgrade. Each frame is hand painted by Jim Allen. Jim was Masi's painter throughout the late 1970's and 1980's. Size Seat Tube (C-T) 2. Top Tube (Effective) 1. Head Angle 6. Seat Angle 3. Chainstay 5. 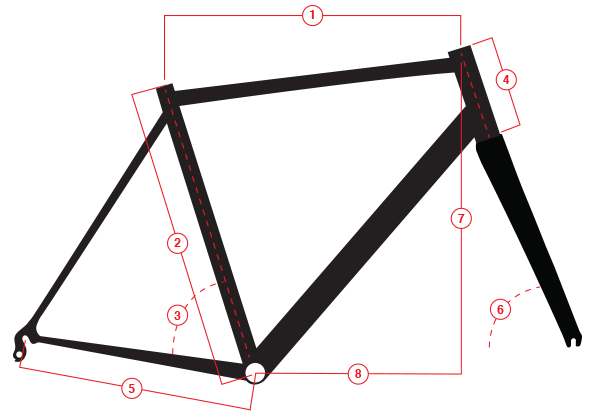 Head Tube Length 4. Stack Height 7. Reach 8.